What is it about an old farmhouse table that tugs at my heart. When I see it I hear it calling my name. I have quite a few of these old tables. But this is the first pink one. Look at that old chippy paint. Sort of reminds me of Annie Sloan Antoinette. I placed it in front of my old farmhouse door in my kitchen. Just a sweet touch of pink. An old bucket filled with dried hydrangeas from last fall. They still hold there color. Looks pretty with a few pink Daisy’s too! 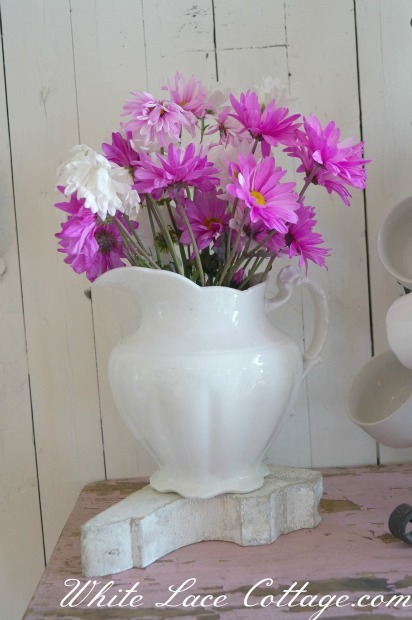 I like it with my daisy’s in my favorite old pitcher on top of an old chippy corbel. Yes I do like this too!But I think for now I will keep this pitcher on the mantle. 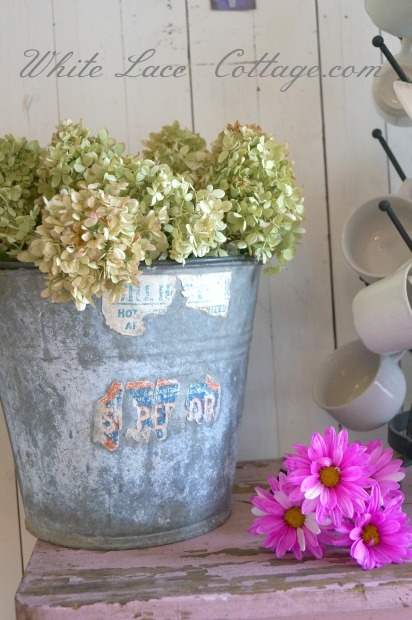 And keep that old bucket on this old farmhouse table. I think for now this is the perfect match. A little pink in the kitchen. Did you notice those sweet wire hearts? Two wire hearts made from wire. They were free when I bought the table. I think I will keep them out for awhile. But they are too sweet to put away. Speaking of Valentines day if you read my facebook page you would have seen the surprise my husband gave my daughter and I. My husband made a special card. One to read together out loud. At that point I think we both screamed! One of our favorite family places to go. It has been five years since we have been there. My daughter has grown so much. Before she is all grown up we wanted to take her back. Now on to planning our trip. Looking forward to making lots of wonderful family memories. Thank you sweet husband you are the best! Don’t want to miss a post? Why not subscribe by email. Just go to the link below. Ohhhhhh Anne this is so romantic and touched my heart. Your hubby is so sweet and what a beautiful surprise for you and your daughter. We go every May to Disney in Florida and it is so much fun to have my whole family together. It is fun now to have my granddaughter at 3 years old enjoying Disney too like my girls did when they were little. You are going to have so much fun. I love going there and I am a grown adult. It is such a fun happy place. I also love the pink table. That is the sweetest find. I love the old bucket on it the best too. You find the best treasures. Have a great day. Awww….how sweet!! I hope you have an amazing, memory-filled trip to Disney! Thank you Angie!It was a amazing and sweet surprise.We are all looking forward to the magic of Disney! What a thoughtful gift, and so sweetly presented. You have a beautiful memory, before you go. Love your touches of pink too. Thank you Rosemary! That was quite a surprise!I had no idea nor did my daughter.Looking forward to this summer for sure! I love your new “old” table!! I like how you’ve styled it too. It reminds me of the one that Chez Fifi has in her kitchen. Congrats on getting the gift to go to Disney World again too! I know you will have a great time. Thank you Kelly! I was admiring this table for sometime.And finally I thought I MUST take it home already!I was furniture stalking LOL! Thank you that was a wonderful surprise from my husband! I did not see that comming! That is just the sweetest thing!!! Love your new pink farm table too….the color is just divine! 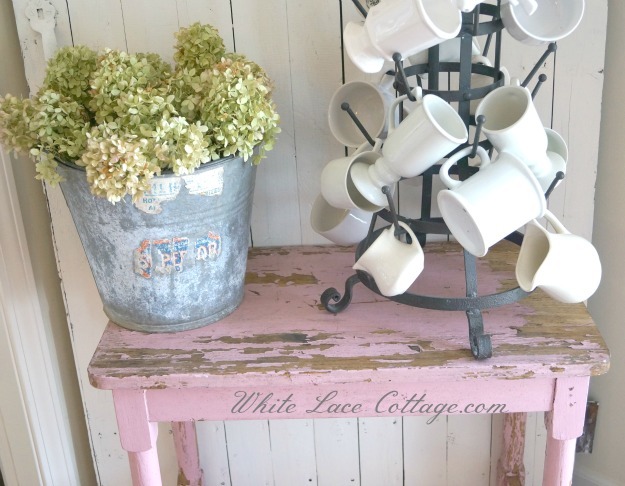 Love your pink farmhouse table!! 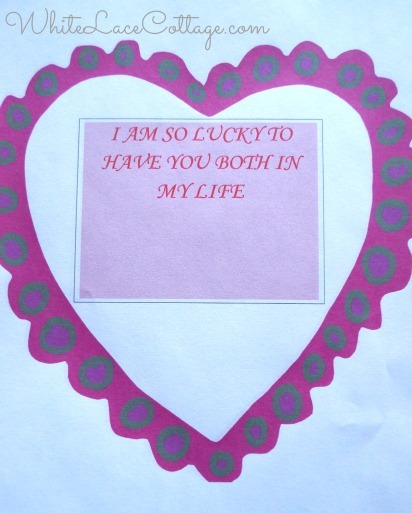 What a sweet Valentine gift from your hubby…how fun!! I haven’t been back to Disney World since I was 16 years old. Yes it was an amazing gift for us all.Looking forward to making lots of wonderful memories. I hope you can get back again soon.You are never too old to be a kid again! Thank you Judy!I love the color too! LOL I am still in shock! Can’t believe we are going I can’t wait! 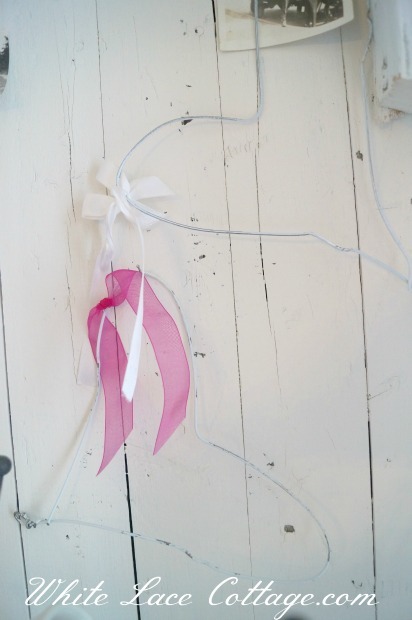 i have a hard time finding chippy pink anything–this is so cute, anne! how charming is your husband?! cute way to give a wonderful trip:) enjoy! Thank you Lyn! This was a fun find! Yes he is awesome I am truly blessed! Thank you Melinda!This was a fun find.Can you believe I passed this up a few times.I was not sure where to put it and finally decided I will find a spot LOL! Oh, and have a fantastic time at Disneyworld!!! Thank you so much!So blessed to be going! You were how cool is that! My husband was there when it first opened too!He lived there at the time. I love your sweet pink table. Both vignettes look wonderful on it. I’m hoping my hydrangea will actually bloom this year! And what a sweet hubby you have! Thank you Shelia that was a cool find! LOVE the color too! Yes I am blessed to have a wonderful husband and daughter! What a beautiful pink table! 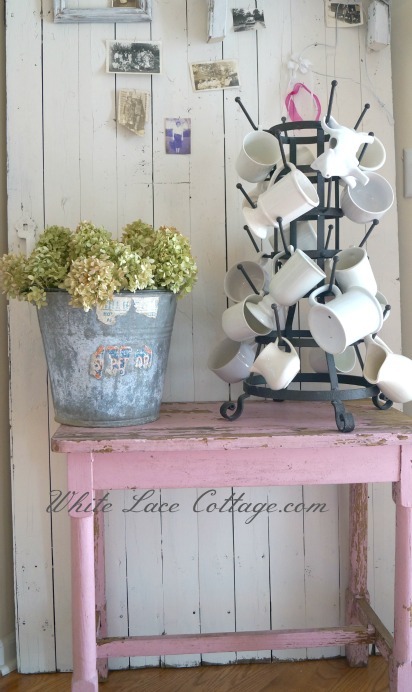 It’s perfect in your kitchen with the drying rack and bucket full of hydrangeas. Wonderful! Have fun at the happiest place on earth!!!! Thank you so much Amy!That was a fun find! We are planning our summer trip now!Can’t wait to go! I’ll say it again, your hubby is a real keeper! I hope you have have a wonderful time in Disney World. They’ve added so much, you are just going to love it! Almost as much as I love that sweet pink table! What a gorgeous vignette. Thanks so much for sharing with us. Thank you so much Patti! I am very thankful for a wonderful husband and family! Oh my goodness…I think your hubbie wins the husband of the year award!! Such a sweet and very cool surprise!! p.s. love your chippy pink table too! Yes it is pretty awesome!We are so excited!I am very thankful to be going! I love the pink table! What a great surprise. Have fun at Disney! Yes it was total surprise! Thank you June!I was so excited to find this!She actually has a really cool chair I am thinking about.Hmmmmm but where in the world to I put it that’s the problem! What a wonderful surprise, you’ll have such a good time. Love, love, love your pink table and pretty pictures. Oh I can’t wait to go.We are planning it now! 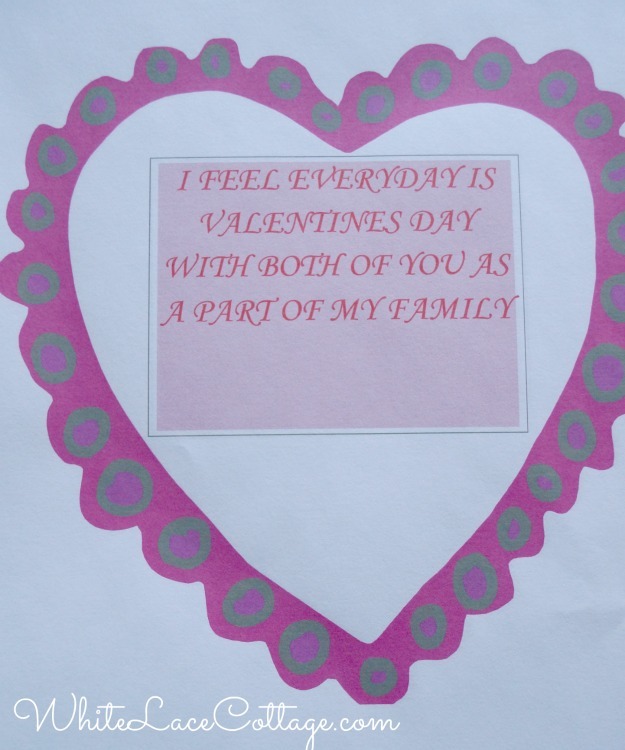 Oh Anne, what a great Valentine’s Day your daughter and you had! What a great husband too! 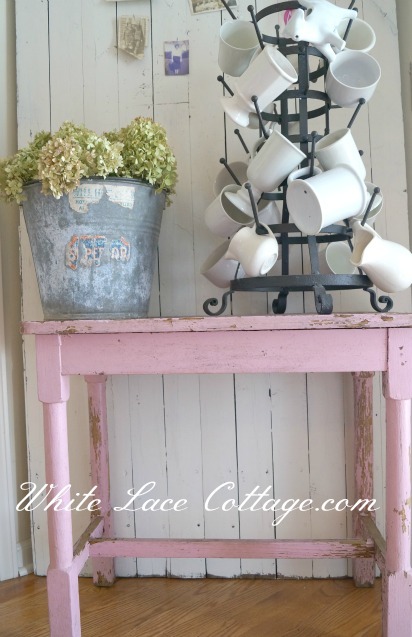 Love the pink table and how you have the old bucket on top! Thank you so much Rondell I too love that table! Yes it was such a wonderful surprise! Anne I love your new table in all it’s chippy goodness! What a sweet hubby you have! Thank you so much Martina!Yes that was a sweet surprise! I love your little pink table and the drying rack and the bucket. So cute! Love your little farm table. I have a hard time turning my back on charming tables too. What a great valentine’s gift!! Thank you Mary Alice!The problem is I find too many of these tables and chairs too and have a hard time figuring out where to put them in my home! Thank you Marty! Yes that was a fun find and super sweet surprise from my husband! How lucky you are! First you keep finding all those farmhouse tables. The pink one is adorable! Second, what a sweetheart you have for a husband! Have a great time on your trip! Thank you Deborah! I just found a cool vintage chippy chair today.Like I need another chippy chair LOL!But I have the perfect spot for it.Sharing soon! Yes he is a wonderful guy I am blessed.Can’t wait to go! 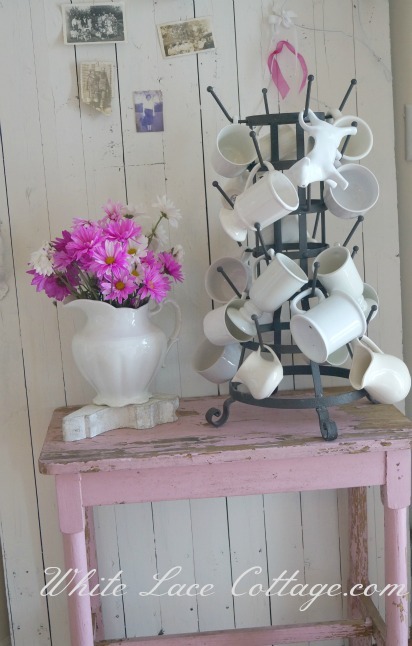 Love the pink farm table you added to your kitchen…it is perfect. Congrats on your trip to Disney. AHHHHH, so fun for you guys to go back to one of your favorite family spots!!! 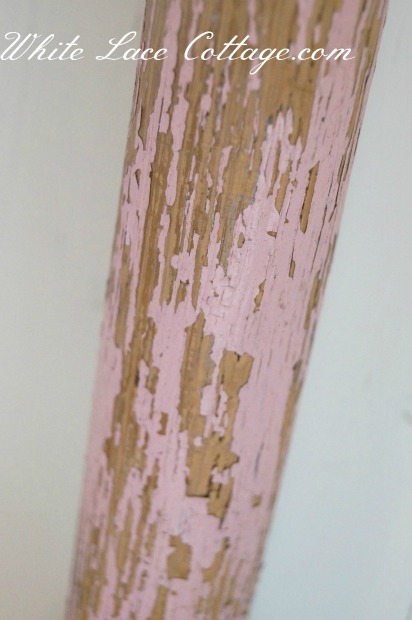 And I love that shade of pink … or is it the chippy paint … either way, it’s perfect! Maybe you’ll have time for a Key West road trip while you’re in Florida?!?! Oh I would LOVE to go to Keywest but it won’t be on this trip.Strictly Disney this time. 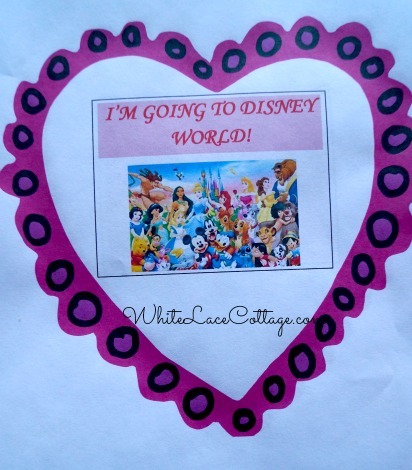 That is one sweet pink table, but a trip to Disney is even sweeter!! Thank you! Oh yes we are so excited!Making all of our plans now! I love that pink table! You found it all chippy perfect like that? I love it. A little pink adds a sweet touch. Thank you Sandy.Yes this is how I found it.Original paint 🙂 .It is so hard to find pieces like this! How lucky you are! What an amazing treat for Valentine’s Day! I know you will have so much fun! PS Your table looks amazing! Thank you!That was quite a surprise! Oh my gosh I am in love with your pink table Anne! It is just darling. Hope you are having a great weekend and thanx for joining THT. Thank you Pamela! That was a fun find! 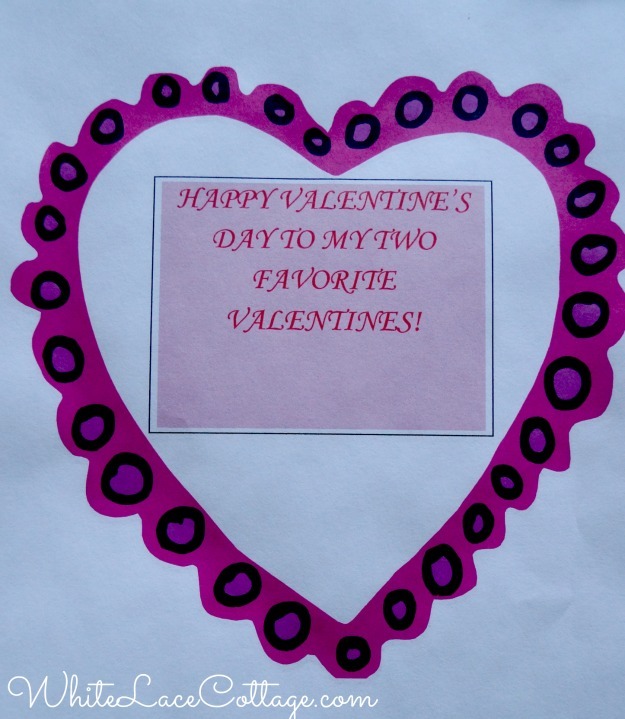 What a sweet and clever way for your hubby to surprise his two favorite girls!! 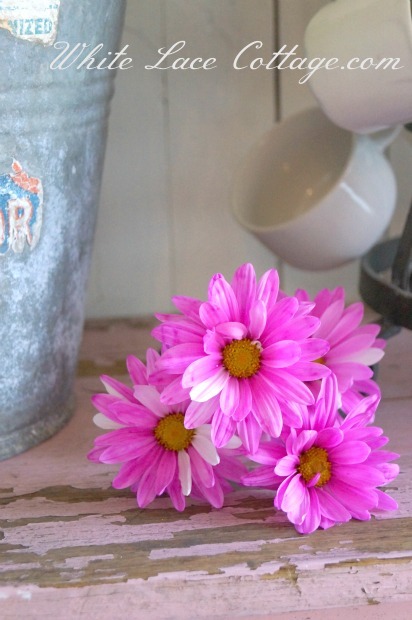 I’m loving the soft worn pink table against the chippy door for just a hint of color in your kitchen. It is the perfect pink! Thank you Vickie!I love this table too.So glad I talked myself into bringing it home. Oh we cannot wait to go back to Disney.If it were not for the almost free airline tickets we would not be going! Wow…how is he going to top that next year!! I don’t think he can Sandi LOL! that pink table is just the cutest!!!!! i absolutely love it! Hi I”m new to your blog and decided to subscribe right away. Love your little pink farm table. Don’t think there are any in this neck of the woods, haven’t ever seen one anyway, anywhere. We don’t have that many antique stores here either. You must have a talent for finding farm tables if you manage to find them often, lucky. And that awesome chippy paint. Your tablescape is wonderful with bucket of hydrangeas, table. What is wrong with having hearts out for decorating all year? They’re such a sweet symbol of love and caring, nice to have out to remind us (if we need reminding). Look forward to visiting your blog often. It has been pure luck to have found those pieces.I cam across a new antique dealer.She has lots of cool treasures.Going back today to see if she brought in anything new!